Yesterday I came across a simple and catching initiative: Dona Nobis Pacem. A blogger called Mimi is inviting fellow bloggers to "light up our beautiful blogosphere with Peace Globes from around the world" on November 7, 2006. She refers to it as a BLOGBLAST FOR PEACE. Read more about how to do it here ... and give it a go if so inclined. Most of what I do creatively is interactive and I therefore love anything that invites interaction, especially for mass positive impact (seen or unseen). 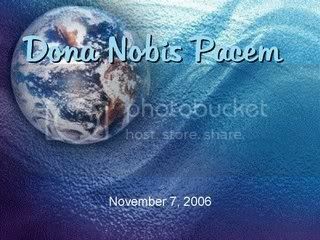 Dona Nobis Pacem has far reaching and powerful symbolic intentions. This world could do with a lot more Pacem! Anyone else who wants to do it. You're on, Elspeth -- I'm in! A creative definition of "Creative"